welcome and thank you for your interest in becoming an MEPD deployed officer! Please add a pic showing the green lenses. I am sure you have them but I have to see a picture nevertheless. Nice helmet and I like the fact that you´ve kept it screen-accurate without adding the mesh behind the teeth. 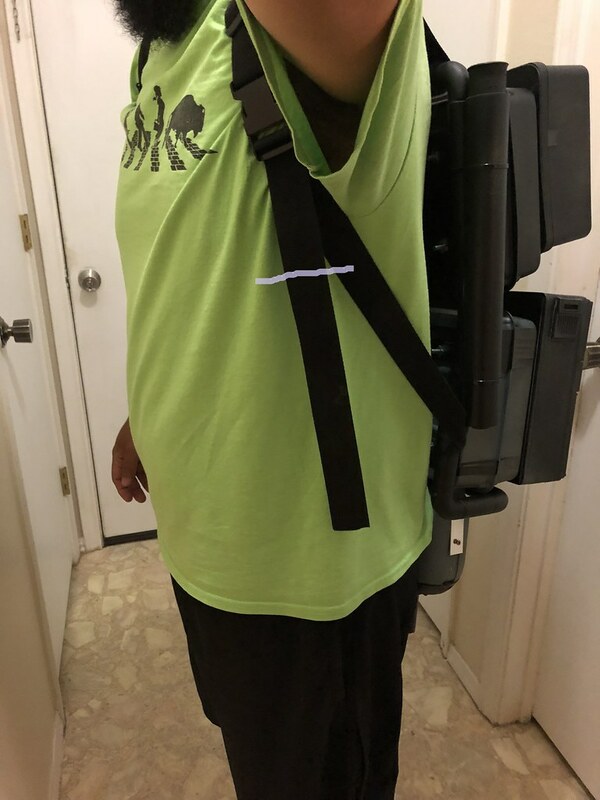 Your left biceps has slipped down and is almost sitting over the shoulder bells, please correct that, I would recommend adding an elastic strap connecting the bell and the biceps, this will keep it put and from twisting. 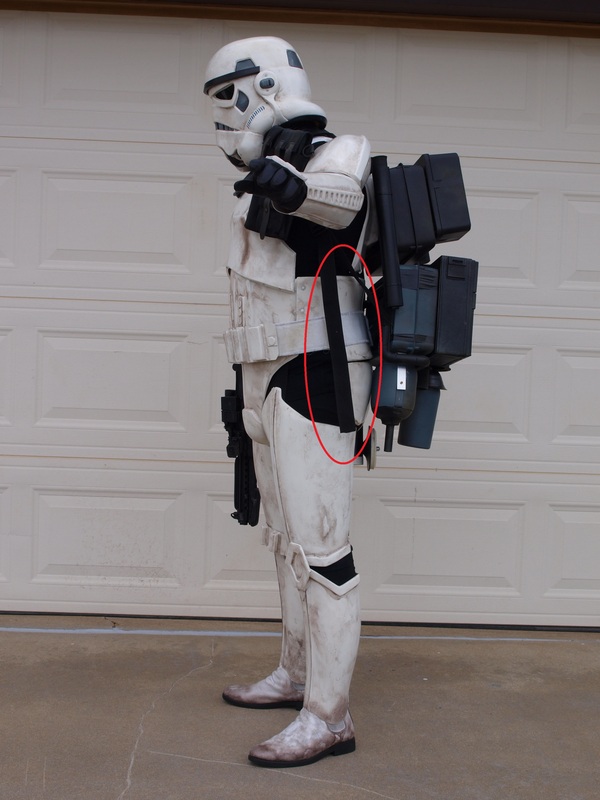 Your thighs are sitting too low, revealing too much black of the undersuit, please shorten the elastic straps to position them a little higher. Another advantage of doing this is giving you more freedom of movement in the knees. The canvas MP40 pouch on your belt is wrong, please change it for one of the following pouches made of leather, furthermore it shouldn´t be positioned at such an angle. That is one nice and detailed pack! The exhaustport looks a little strange to me but hard to tell if it had such a curve in the movie or if it was rather straight as on most packs on here. Both your guns need some dirt or a more worn and used look, they still look factory-fresh. If you decide to make the DLT your weapon of choice, you´ll have to add the wire holding the T-tracks on the front part too (seems to be missing there) and I will also have to see a picture of the left side of the pistol grip where a small disc greebly should be found. David, this was your first review! Please add the new pictures and put on your armor once more. Keep up the good work, those changes shouldn´t be too difficult for you. I´m looking forward to seeing some new pics of your improved gear soon. Looks awesome. Is that a handbuilt pack? I had RS props make the kit and then I went in and did some handy work with it. Looks very promising already, good luck with your deployment! Thank you so much. I have ordered the MP40 from trooperbay and I weathered the E-11 and the DLT. I will get the remainder of the items taken care of soon. Is that canvas pouch what RS provided for you? The first picture in this post has the MP40 case. All new photos on the requested updates and I have decided to use the E-11 as the blaster of choice. I adjusted the thigh armor and the biceps per your suggestions deployment officer Hausi. 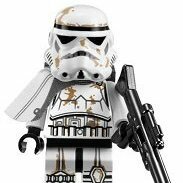 This trooper is ready to make some arrest and awaits your command! But I have to agree with my fellow deployment officer bigwam, please shorten the backpack straps,that's an easy one! Just show me a pic of the pack with the shortened strap, no need to suit up again. Please also add a pic of your new leather pouch with some weathering added (way too clean) , easiest to give it a wash with some watered down brown/earth colour and dabbing most of it off again with paper towels, repeat until you are pleased with the amount of dirt. I also suggest doing the same with the shoulder pouch. I will get these items done today and thanks again! I am sorry but I tried and tried to get the backpack photo to show vertically and I could not get it to work. I tried all sorts of things and I hope this works. Sorry, I was not sure what was meant by shortening the strap. I will get it cut today and upload a new picture. Here you go and thanks for being patient with me! It's great to see that people are interested in reaching an even higher level in accuracy and we are here to help you and get you deployed so don't worry at all David. I'm sorry if it wasn't completely clear before but now it's looking good. Please show me a pic of the left side too and then we are good to go for the next review. Thanks again I am glad to be a part of this group and I want to achieve deployed status, so thank you for the assist! 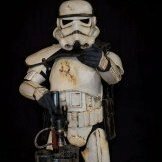 Your armor suits you well and I really like your weathering, great job! Your E-11 is cleared now, although I would still highly recommend getting rid of those wires connecting the Hengstler counter and the powercylinders, or even encourage you to build yourself a Tunisian Bapty variant of the E-11, that would be even more accurate. Don´t forget to add those wires around the T-tracks on your DLT. David, this was your second review, thank you for your patience and your willingness to deliver all those pics I asked for, even if it was a struggle to get them to show vertically …and it was worth it, I think your gear looks even better now than it already did before, congrats mate, well-deserved! Thank you so much and I am honored to be a part of the Deployed Officer Corps! I will remove the wires from the E-11 and I have added the T-tracks of the DLT-19. Thanks again for the guidance and I appreciate the insight. Time to make some arrest!